In recognition to the teachers’ pivotal role in educating the young generation while exerting all efforts in preparing them to be the backbone of a prosperous Kuwait, The Sultan Center celebrated the World’s Teachers Day with customers at TSC Salmiya, Boulevard and Sharq. 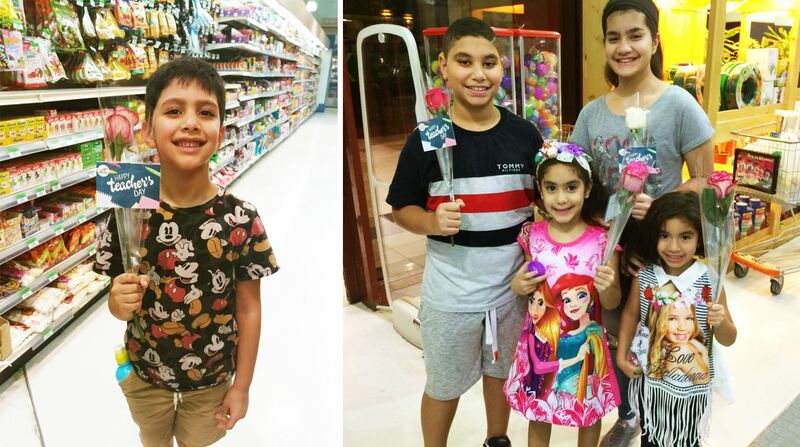 On October 4th, TSC distributed flowers and “Thank You” cards to the young customers who have handwritten on their appreciation to their teachers; kids were thrilled to share both the flowers and Thank You cards with their teachers on their day!! In addition to that, TSC team produced a small video with live testimonial from the kids, who expressed their love and thanked the teachers for their continuous support. The video was posted on TSC’s various social media channels including Facebook & Instagram. “Teachers are valuable to our society and TSC thanks them for their remarkable effort and contribution in raising our future generation. TSC initiative was a gesture to re-compensate our teachers for their loyalty and professionalism as well as their responsibility to prepare the young generation for a brilliant future marked with ethics and professionalism”, said, Jaafar Sayed – TSC Salmiya Store Manager.